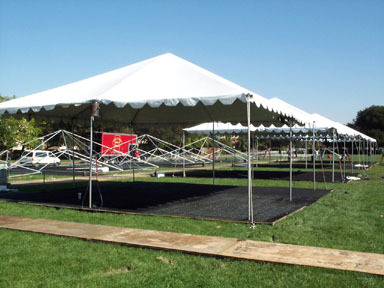 EPS provided electrical, lighting and other services for Michael Hensley Party Rents at Stanford University for Homecoming Weekend at two venues - Wilbur Field and in front of the Law School. EPS Equipment trucks near 40' x 40' canopy frame. Raised central walkway between canopies. EPS provided lighting for this 300' long walkway. PAR 64 instruments used for outdoor lighting, mounted on canopy frames. EPS 48 x 2.4kw dimmer rack, hidden in a canopy behind one of the 40' x 40' canopies. EPS provided lighting in the 100' x 60' Law School canopy, used for parties on three nights during Homecoming weekend.